My niece took this picture before I arrived. A couple of days ago. I received a phone call from my sister about three baby squirrels that were found inside of a tree that they had cut down in their backyard. After chastising her that this was the worst time of the year to have a tree cut down because of all the babies, I went over to her house to pick up the little ones. My sister told me that the tree was leaning dangerously and they needed to have it taken down before the storm season. She was right because if the tree fell it would indeed destroy their house. However, I was told that the people cutting down the tree did not care in the slightest about the three now orphaned squirrels and one even made the comment “oh well, it’s just a couple less squirrels.” I was not too happy about this, and checked the remnants of the tree to make sure that there were no other babies in need. 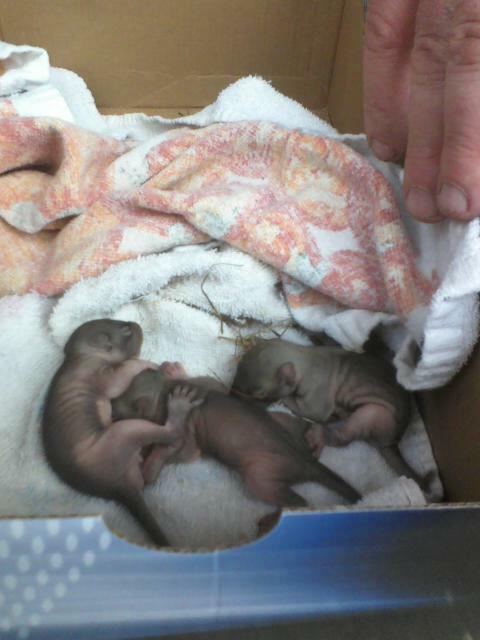 I then attempted to find a wildlife rehabber who would be able to take in these babies. I was not successful finding anyone locally. 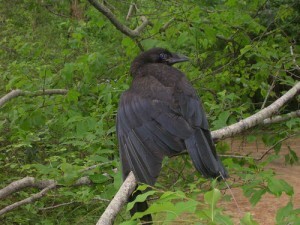 I then contacted the Dane County Humane Society’s Four Lakes Wildlife Center. The staff member that I spoke with could not have been more helpful and told me that she would happily take the babies in and would wait until I arrived. After putting the babies in a box, covering them with small towels, and placing a hot water bottle near them, my niece and I made the drive to Madison. This is the second time that I have transported an injured or orphaned animal(s) to the Four Lakes Wildlife Center. These people are dedicated and truly care for the little ones under their watch. Because it was near closing time when I called, the staff member had to stay until I arrived. When I arrived she happily took the babies and thanked me for bringing them in. At that moment I was reminded that there are indeed people out there how do care for and love our wild friends. With all of the violence toward our wild friends going on around us, it was truly a wonderful feeling to see such dedication and caring. If anyone is ever looking for a worthy cause to donate time or money to, the Four Lakes Wildlife Center is a great option. They are also extremely helpful if you ever come in contact with injured or orphaned wildlife near Madison. If you ever have a question about whether an animal is truly orphaned or injured please call them at (608) 838-0413. I have been transporting injured and orphaned animals to rehabbers for almost the past decade. These are some of the most dedicated and under-apprecaited people there are. I have nothing but respect and love for them, and I try to help whenever I can. How wonderful and lucky squirrels. I have donated to them in the past. I was not too happy when I found out that they were having the tree cut down now that babies are everywhere. But I did see the tree and a good gust of wind would have toppled it. I feel so bad that the mother ran off and that her nest full of babies and the tree would be gone when she returned, but they would have died if we didn’t get them help. This is one of those times that I could actually save some animals and not have to fight to do it. I take advantage of those opportunities whenever I can.